How did the wrong envelope get into Warren Beatty’s hands? 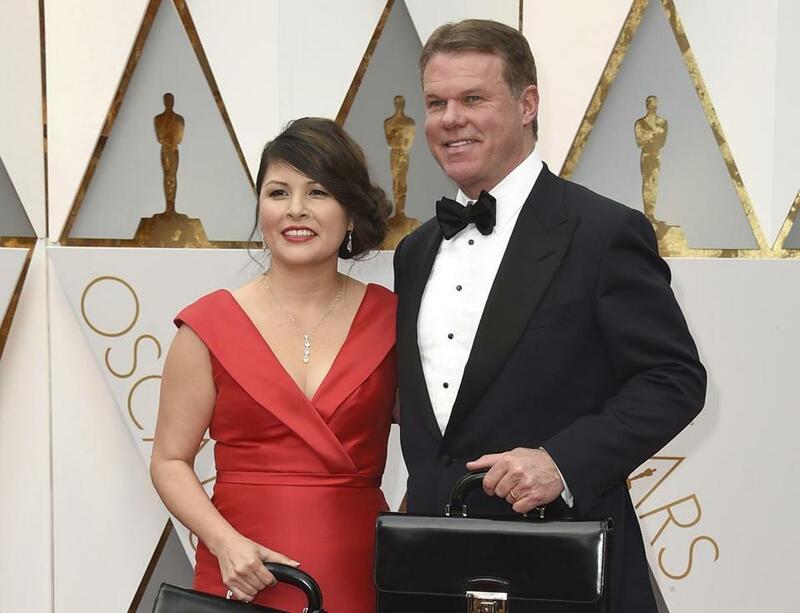 Martha Ruiz and Brian Cullinan from PricewaterhouseCoopers at the Oscars. What’s behind the bizarre mix-up that stole the show at this year’s Oscars? Presenters Warren Beatty and Faye Dunaway, who went on stage to hand out the award for best picture, had mistakenly been given an envelope for a different category, according to PricewaterhouseCoopers, the auditing firm that oversees envelope-handling for the Academy Awards. Media reports Monday afternoon said that one of two PwC partners in charge of handing out the envelopes to presenters handed the wrong one to Beatty, moments after tweeting a celebrity photo from backstage. How exactly that happened is still under investigation, the firm says, but it seems that the existence of duplicate envelopes for every award category may have contributed to the gaffe. 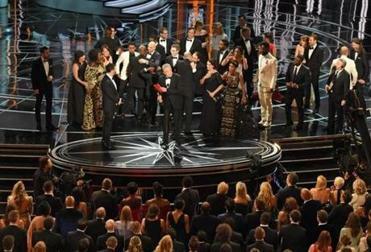 The auditing firm PricewaterhouseCoopers issued a statement early Monday apologizing for the best picture mixup at the Oscars. Here’s a rundown of how envelope hand-offs are supposed to work. This may help explain where things went wrong Sunday night. For more than eight decades, PwC has been overseeing the Oscars balloting process, which involves collecting ballots, tallying the votes, and then delivering sealed envelopes bearing the winners’ names. Each year, two members of the company’s Los Angeles office are tapped to be “balloting leaders,” putting them in charge of the process, according to overviews PwC has published on its website in recent years. Ahead of the awards ceremony, hand-written votes for each of the 24 major categories are counted, by hand, in an undisclosed location and the results are kept under wraps. The only two people who should know the results are the two balloting leaders, who memorize the winners so there’s no list that could leak out early. On Oscar night, each of the two balloting leaders carries a special briefcase containing envelopes for each award winner. This means there are two identical envelopes for each winner — and that appears to be a key factor in explaining how Sunday’s confusion could have happened. The balloting leaders aren’t to let the briefcases leave their side or let anyone peek inside. They take separate cars that journey separate, secret routes to the show, and each one is accompanied by off-duty, fully-armed police officers dressed in tuxedos as they enter the show via the red carpet. Here’s a picture of this year’s balloting leaders, Brian Cullinan and Martha Ruiz, that PricewaterhouseCoopers tweeted Sunday night. Once inside, the two ballot leaders station themselves on opposite sides of the stage throughout the ceremony and one of them hands the envelopes to the presenters, depending on which side of the stage the presenters enter from. The outside of the specially-crafted envelopes are labeled with the name of the appropriate category. Here’s a picture the firm tweeted Sunday night of Cullinan and Ruiz backstage. On Sunday night, Beatty and Dunaway took the stage to present the final award of the night, the winner for best picture. They first announced that “La La Land” won. Members of that film’s cast and crew lined the stage, rattling off some thank-you’s, before their acceptance speeches were interrupted. Upon further review, when Beatty and Dunaway made the errant announcement, they were seen holding an envelope labeled “actress in a leading role,” according to a photo shared on Twitter by ABC News. And Stone said after the ceremony backstage that when she won the best actress award, she received a “‘best actress in a leading role’ card,” and held onto the card the “entire time,” through when the best picture winner announcement was made moments later. “Whatever story that was, I had that card,” Stone said. That suggests that when Beatty and Dunaway went on stage to announce best picture, they somehow got a hold of the second copy of the best actress envelope that the PwC ballot leaders were carrying. Media outlets, including USA Today and The New York Times, reported Monday afternoon that Cullinan was the one who handed Beatty the wrong envelope. Cullinan, described on PwC’s website as a “Matt Damon lookalike,” received a master’s degree in financial accounting from Northeastern University and began his career with PwC in Boston, according to a 2012 press release from the firm. “What happened was, our partner on the left side of the stage, Brian Cullinan, he handed the wrong envelope to Warren Beatty,” Tim Ryan, U.S. chairman and senior partner of PwC told USA Today. The Wall Street Journal also reported Monday afternoon that, just minutes before the mistake, Cullinan tweeted a backstage photo of Stone that was later deleted, apparently. The best-actress envelope Cullinan wrongly handed to Beatty was a duplicate, according to the Journal. Ruiz was the one who, moments before Cullinan’s error, had correctly handed her copy of the best-actress envelope to Leonardo DiCaprio who presented that award to Stone. The Times also reported that the design of the envelopes may have been a factor. PwC, on Monday morning, apologized and said it was investigating, but, beyond Ryan’s comments to USA Today, the firm had not commented further as of Monday afternoon. The mistake came days after a Huffington Post article on the process for handling the envelopes containing the names of the award-winners, where PwC officials downplayed the possibility of such a mistake. “It’s so unlikely,” Cullinan told the news outlet. The mix-up Sunday night was certainly unusual, but not entirely unprecedented. In 1964, Sammy Davis Jr. was given the wrong envelope and ended up announcing the winner of a different category before a PwC representative quickly came on stage with the correct envelope, according to the Los Angeles Times. In 1996, Sharon Stone and Quincy Jones were presenting back-to-back awards. But Stone, after announcing the first award, accidentally handed both envelopes to that winner, leaving her and Jones without an envelope to announce the second winner. “While Stone stalled, Jones stepped offstage for some assistance from [one of the PwC balloting leaders], who had, of course, memorized all the winners,” PwC said in an overview published in 2009.